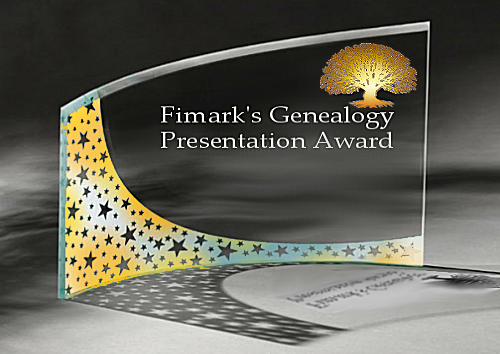 Announcing Fimarks Genealogy Presentation. Award Winners. Genealogists and genealogy enthusiasts have been presenting genealogy records, family trees, pedigrees, heirlooms, artifacts and research in innovative and creative ways for centuries. This awards program promotes the work of genealogist and the craft of unique presentation design. Winners are Voted 4-5 stars and awarded one Like by Fimark's Genealogy Presentation Awards panel. Winners are determined based on genealogy presentation creativity, professional, practicality and use. Other criteria may include inspirational work of art or craft and exceptional presentation design. Entries can be made by emailing fimarkhome@gmail.com with a link to the genealogy presentation or sending a photo of the presentation to http://www.pinterest.com/fimarkhome. Visit http://www.pinterest.com/fimarkhome/genealogy-presentation-awards to view this years winners creative and inspiring genealogy presentations. Fimark Home Online is a division of Legendary Heritage Heirlooms, a family reunion planning group of over 2000 members with a focus on family values and needs awareness. The group started the movement in 2005 by promoting the month of November as Annual Family Reunion Planning Month. Not a member yet? Simply join the family reunion planners group by suscribing to this blog and leaving an article comment or join pinterest and send a pin of your work to http://www.pinterest.com/fimarkhome.